Not to be confused with Enter The Wild (2018) or Wild (2014 film). Into the Wild is a 2007 American biographical survival film written, co-produced, and directed by Sean Penn. It is an adaptation of Jon Krakauer's 1996 nonfiction book of the same name, based on the travels of Christopher McCandless across North America and his experiences in the Alaskan wilderness in the early 1990s. The film stars Emile Hirsch as McCandless, and Marcia Gay Harden and William Hurt as his parents, and features Jena Malone, Catherine Keener, Vince Vaughn, Kristen Stewart, and Hal Holbrook. The film premiered during the 2007 Rome Film Fest and later opened outside Fairbanks, Alaska on September 21, 2007. It was nominated for two Golden Globes and won the award for Best Original Song: "Guaranteed" by Eddie Vedder. It was also nominated for two Academy Awards: Best Editing and Best Supporting Actor for Holbrook. In April 1992, Christopher McCandless arrives in a remote area just north of the Denali National Park and Preserve in Alaska. Noting Chris' unpreparedness, the stranger who drops him off lends him a pair of boots. Chris travels into the wilderness and sets up a campsite in an abandoned city bus, which he calls "The Magic Bus". At first, McCandless is content with the isolation, the beauty of nature around him, and the thrill of living off the land. He hunts with a .22 caliber rifle, reads books, and keeps a diary of his thoughts as he prepares himself for a new life in the wild. Two years earlier, in May 1990, McCandless graduates with high honors from Emory University. Shortly afterwards, McCandless rejects his conventional life by destroying all of his credit cards and identification documents. He donates nearly all of his savings to Oxfam and sets out on a cross-country drive in his Datsun 210 to experience life in the wilderness. McCandless does not tell his parents, Walt and Billie McCandless, or his sister Carine what he is doing or where he is going. He refuses to keep in touch with them after his departure, causing his parents to become increasingly anxious and eventually desperate. At Lake Mead, McCandless' car is caught in a flash flood, causing him to abandon it and begin hitchhiking. He burns what remains of his cash and assumes a new name: "Alexander Supertramp." In Northern California, McCandless encounters a hippie couple named Jan Burres and Rainey. Rainey tells McCandless about his failing relationship with Jan, which McCandless helps rekindle. In September, McCandless arrives in Carthage, South Dakota and works for a contract harvesting company owned by Wayne Westerberg. He is forced to leave after Westerberg is arrested for satellite piracy. McCandless then travels on the Colorado River and, though told by park rangers that he may not kayak down the river without a license, ignores their warnings and paddles downriver until he eventually arrives in Mexico. There, his kayak is lost in a dust storm, and he crosses back into the United States on foot. Unable to hitch a ride, he travels on freight trains to Los Angeles. Not long after arriving, however, he starts feeling "corrupted" by modern civilization and decides to leave. Later, he is forced to resume hitchhiking, after being beaten by railroad police. In December 1991, McCandless arrives at Slab City, in the Imperial Valley, and encounters Jan and Rainey again. There, he also meets Tracy Tatro, a teenage girl who shows interest in McCandless, but he rejects her because she is underage. After the holidays, McCandless decides to continue heading for Alaska. One month later, camping near Salton City, McCandless encounters Ron Franz, a retired man who recounts the story of the loss of his family in a car accident while he was serving in the United States Army. He now occupies his time in a workshop as an amateur leather worker. Franz teaches McCandless the craft of leatherwork, resulting in the making of a belt that details McCandless' travels. After spending two months with Franz, McCandless decides to leave for Alaska, despite this upsetting Franz, who has become quite close to McCandless. On a parting note, Franz gives McCandless his old camping and travel gear, along with the offer to adopt him as his grandchild, but McCandless simply tells him that they should discuss this after he returns from Alaska. Four months later, at the abandoned bus, life for McCandless becomes harder, and he begins to make poor decisions. As his supplies begin to run out, he realizes that nature is also harsh and uncaring. McCandless concludes that true happiness can only be found when shared with others, and he seeks to return from the wild to his friends and family. However, he finds that the stream he had crossed during the winter has become wide, deep, and violent due to the snow thaw, and he is unable to cross. Saddened, he returns to the bus. In a desperate act, McCandless is forced to gather and eat roots and plants. He confuses similar plants and eats a poisonous one, falling sick as a result. Slowly dying, he continues to document his process of self-realization and imagines his family for one last time. He writes a farewell to the world and crawls into his sleeping bag to die. Two weeks later, his body is found by moose hunters. Shortly afterwards, Carine returns to Virginia with her brother's ashes in her backpack. The scenes of graduation from Emory University in the film were shot in the fall of 2006 on the front lawn of Reed College. Some of the graduation scenes were also filmed during the actual Emory University graduation on May 15, 2006. The Alaska scenes depicting the area around the abandoned bus on the Stampede Trail were filmed 50 miles (80 km) south of where McCandless actually died, in the tiny town of Cantwell. Filming at the actual bus would have been too remote for the technical demands of a movie shoot. A replica bus used in the movie is now a tourist attraction at a restaurant in Healy, Alaska. The review aggregator Rotten Tomatoes reports that 82% of 194 reviews of the film were positive, resulting in a "Certified Fresh" rating. Its consensus read: "With his sturdy cast and confident direction, Sean Penn has turned a complex work of nonfiction like Into the Wild into an accessible and poignant character study." Metacritic assigned the film an average score of 73 out of 100 based on 38 reviews from mainstream critics. Roger Ebert of the Chicago Sun-Times gave the film four stars out of four and described it as "spellbinding." Ebert wrote that Emile Hirsch gives a "hypnotic performance," commenting: "It is great acting, and more than acting." Ebert added, "The movie is so good partly because it means so much, I think, to its writer-director, Sean Penn." The American Film Institute listed the film as one of ten AFI Movies of the Year for 2007. National Board of Review named it one of the Top Ten Films of the Year. Into the Wild also ranks 473rd in Empire magazine's 2008 list of the 500 greatest movies of all time. In North America, Into the Wild initially opened in limited release, in four theaters and grossed $212,440, posting a per-theater average of $53,110. For the next several weeks, the film remained in limited release until it expanded to over 600 theaters on October 19, 2007; in its first weekend of wide release, the film grossed just $2.1 million for a per-theater average of $3,249. As of December 25, 2008, the film grossed $18,354,356 domestically and $37,281,398 internationally. In total, the film has grossed $55,635,754 worldwide. Into the Wild was released on March 4, 2008 on standard DVD, Two-Disc Special Collector's Edition DVD, and standard HD DVD. The special edition DVD and HD DVD contain two special features entitled The Story, The Characters and The Experience. The Blu-ray Disc edition was released in France on July 16, 2008. The Blu-ray edition for the US was released on December 16, 2008. The songs on the soundtrack were performed by Eddie Vedder, lead singer of Pearl Jam, and Jerry Hannan. Vedder won a Golden Globe for Best Original Song for the song "Guaranteed". The score was written and performed by Michael Brook and Kaki King. The music at the end of the theatrical trailer is "Acts of Courage" by X-Ray Dog, a company that supplies music for many movie trailers. Eddie Vedder said whilst writing the songs on the album "I spent three days giving him (Sean Penn) colors that I could paint with. Different sounds. It would be pump organ and vocal, or it would be an uptempo song. I just gave him 25 minutes of music, stuff I felt that were colors on the palette. And I really didn't think anything was gonna come out of it. Maybe a little piece or something". The Call of the Wild, a 2007 documentary about McCandless made by Ron Lamothe. ^ a b c d e "Into the Wild". AFI Catalog of Feature Films. Retrieved June 27, 2017. ^ a b "Into the Wild (2007)". The-Numbers.com. Nash Information Services. Retrieved 2018-10-25. ^ "'Into the Wild' premieres in Fairbanks". Anchorage Daily News. September 4, 2007. Archived from the original on September 14, 2008. Retrieved July 17, 2008. The debut of "Into the Wild", a movie directed by Sean Penn about a 24-year-old man who starved to death in the Alaska wilderness, drew a packed house Monday night. ^ "Remake of "Nerds" Film Scrapped". The Emory Wheel. Archived from the original on 2008-12-18. Retrieved 2008-01-29. ^ "The Cult of Chris McCandless". Men's Journal. Archived from the original on June 8, 2008. Retrieved August 2, 2008. ^ "See the "Into the Wild" replica bus from the movie". Trip Advisor. Retrieved 2015-07-15. ^ "Into the Wild (Rotten Tomatoes)". Rotten Tomatoes. Retrieved July 9, 2011. ^ "Into the Wild (2007): Reviews". Metacritic. Retrieved December 31, 2007. ^ Roger Ebert (September 29, 2007). "Into the Wild (xhtml)". Chicago Sun-Times. Retrieved December 31, 2007. ^ "The Golden Globe Awards". The Washington Post. Retrieved 24 April 2016. ^ "Hollywood Foreign Press Association 2008 Golden Globe Awards for the Year Ended December 31, 2007". Golden Globes. December 13, 2007. Archived from the original on December 15, 2007. Retrieved December 17, 2007. ^ "No Country for Old Men, Juno named to AFI's Top 10 of year". CBC. December 17, 2007. Retrieved December 31, 2007. ^ "Top Ten Films". National Board of Review. Archived from the original on 2 February 2004. Retrieved 17 August 2013. ^ "Empire's 500 Greatest Movies Of All Time". empireonline.com. ^ a b c d e f g h i j k l "Metacritic: 2007 Film Critic Top Ten Lists". Metacritic. Archived from the original on January 2, 2008. Retrieved January 1, 2008. ^ "Ben Lyons' Top 10 Films of 2007 – Photo Gallery". E!. Retrieved July 23, 2008. ^ a b David Germain; Christy Lemire (December 27, 2007). "'No Country for Old Men' earns nod from AP critics". Associated Press, via Columbia Daily Tribune. Archived from the original on January 3, 2008. Retrieved December 31, 2007. ^ "Metacritic: 2007 Film Critic Top Ten Lists". Metacritic. Archived from the original on January 9, 2008. Retrieved November 13, 2011. ^ "Into the Wild (2007)". Box Office Mojo. Retrieved December 25, 2008. ^ "Amazon.com: Into the Wild". amazon.com. ^ "Amazon.com: Into the Wild (Two-Disc Special Collector's Edition)". amazon.com. 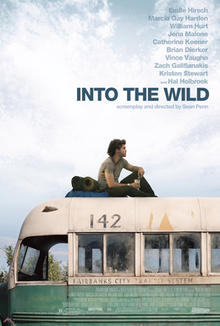 ^ "Amazon.com: Into The Wild [HD DVD]". amazon.com. ^ "Cinéma et Séries TV - MYTF1News". MYTF1NEWS. ^ "'Into the Wild' Coming to Blu-ray". highdefdigest.com. ^ Whitney, Pastorek (14 September 2007). "Eddie Vedder on his solo soundtrack work". Entertainment Weekly. Retrieved 1 December 2016.